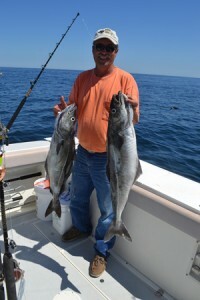 We run our Maine Deep Sea Fishing Charter and Custom Casco Bay Cruises & Tours operation from May 1st to October 15th. All reservations are on a first come, first served basis and we recommend that you book your Maine Deep Sea Fishing Charter or Custom Casco Bay Cruises & Tours reservation early. If you are seeking a shark fishing trip, the best dates are from the mid to the end of July (depending on water temp) through September. All half day Maine Deep Sea Fishing trips are on inshore shoals, up to 10 miles offshore and there is no guarantee on catching fish. All full day Maine Deep Sea Fishing trips are up to 45 miles offshore and you are GUARANTEED to catch fish or the next trip is free. All charters and prices are for up to 6 people unless noted otherwise. We proudly participate in the Apex Predator Tagging Program. Book your Maine Deep Sea Fishing Trip or Casco Bay Cruise and Tour today!!! Or, know that someone else will be catching your fish and having your fun!!! You do not need to purchase a Maine Saltwater fishing license when you fish on our boat. Please leave your coolers in the car as we have ample fish storage boxes and coolers for your beverages. We remind you that we reserve the right to limit our guest’s consumption of alcohol so that we can keep you safe. ABSOLUTELY NO DRUGS!! !